Here’s a recipe that is has it ALL. It tastes fabulous, it’s simple to make, and it looks really impressive… what more could you want?! I made this for my family this weekend and everyone agreed that it was a terrific recipe that I had to share as soon as possible. I’ll admit that the name of this recipe sounds a bit odd, but it really is a good descriptor, if you look at the photos. I was using the base from a previous post (Weeknight Taco Pie) and then got a little creative after watching our cousin Ann whip up a delicious lunch that looked like something from a magazine. Since I wasn’t going to have a lot of time for dinner prep on Sunday, I decided to cook the “taco meat” part of this meal a day ahead of time. I started with one package of ground turkey, one packet of taco seasoning and some red wine. I cooked the ground turkey, added the entire packet of taco seasoning, and then added the red wine. I substituted approximately the same amount of red wine as the packet called for water (ok… I guestimated, since I didn’t want to use a measuring cup) and allowed the browned ground turkey to soak up every ounce of liquid and taco seasoning before adding one jar of black bean salsa (of the “medium-heat” variety). NOTE: Since I wasn’t at home and didn’t have any James River Cellars wine on hand, I used a bottle of Malbec that I chose at the local market. I like Malbec, as a general rule of thumb, so this was an easy call for me. Remember… use the wine you like to drink or have on hand. If I’d had an open bottle of Pinot Noir, I could certainly have used that. The flavor will differ slightly from varietal to varietal, but that’s what makes cooking so much fun. You can also leave the wine out entirely and just use water OR you can add beef stock/broth in place of the water. USE THE FORCE… be brave! I cooked the taco/salsa mixture until it was very dry and allowed it to cool a bit before storing it in the fridge for the night. I don’t always do this, but it actually allowed the flavors to meld and mellow a bit, which was welcome surprise. If you like your food spicy, feel free to use more seasoning or amp up the flavor using a different salsa. That’s the beauty of making your own food… you can do what you like! The fun part of this dish came when I decided not to put the taco mixture into a pie plate and bake it. On a cookie sheet lined with foil (and sprayed with cooking spray), I laid out two packages of refrigerated crescent dough beside one another (so it looked like a really long rectangle. I then spooned the taco/salsa mixture down the center and topped it with one package of shredded Mexican-style cheese (again… use what you like here). Using a knife, I made slits along each side (making sure they matched), starting at the meat mixture and going to the outside edge of the dough (but don’t cut through the foil). Here’s where it got COOL. Gather up corresponding edges of dough, bring them to the center, twist them, and lay them back down in line (or slightly overlapped… YOUR CHOICE). Repeat this with all the strips of dough until you get to the end, then pinch the ends closed. It should look like the photo on the bottom left-hand corner. If you want to be really fancy, top with cheese (like I did in the photo), brush with a simple egg wash (easy if you use some egg substitute and a little water), or just spray with cooking spray. 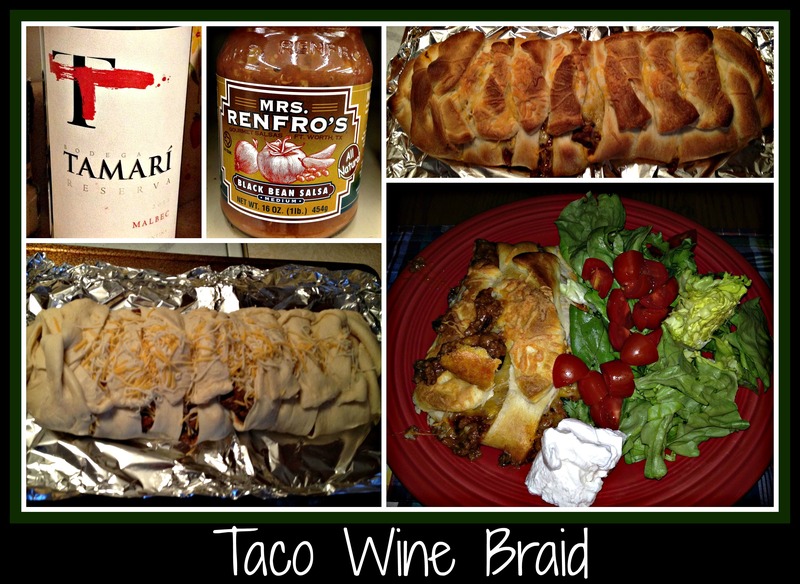 Pop your Taco Wine Braid into a 375 degree oven for 15-20 minutes, until the dough is nicely browned and you can see some bubbling of the taco meat peeking through the holes in the braid. Let it sit for a few minutes while you gather the plates to serve this gorgeous dinner to your adoring public. I like to serve this dinner with some lettuce, tomato, and sour cream… again, this is all personal preference. For our dinner, I used one head of butter lettuce (because the romaine looked like it would be too much), a small container of grape tomatoes, and a tiny package of light sour cream. Whatever you choose will be wonderful as long as you use what you like or have on hand. This was a dinner that was a huge hit with everyone in my family. See if you don’t get some rave reviews of your own if you make it sometime soon for your own family. Enjoy! This entry was posted in Cooking, Recipe, Wine and tagged cheese, crescent dough, dinner, easy recipe, ground turkey, Malbec, red wine, taco.